We hope this community serves as a resource for parents, teachers, librarians, publishers, and authors! Our next linkup will be Saturday, October 7th and the first Saturday of each month. Our theme for October (7th) will be #ownvoices. The #ownvoices hashtag was created to draw attention to diverse authors and illustrators who are creating books that honor their own heritage and experiences. Please share your favorite titles or authors / illustrators with us! 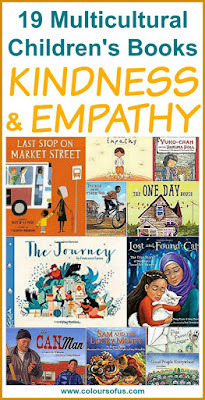 The most-clicked post from the previous #diversekidlit was one I am sure we all could use: 19 Multicultural Children's Books teaching Kindness & Empathy. This fabulous collection of picture books covers a wide range of cultures and topics including issues around immigration, acceptance, jealousy, and more. Thanks for sharing, Svenja!